Compared to a typical 4U server with 8 double-wide slots, the new TeraBox 1432D offers double the density per rack unit, both in terms of compute and I/O. At SC17, home to the latest high-performance computing technology, BittWare announced the TeraBox 1432D high density 1U FPGA server. Based on a Dell PowerEdge C4130, the customized TeraBox 1432D provides an unprecedented thirty-two 100GbE ports directly connected to four large Xilinx or Intel FPGAs on BittWare accelerator cards. This server targets users requiring the highest density of large FPGAs with directly-connected I/O for clustering or networking. "We've doubled the density per rack unit of our original 4U TeraBox and given HPC users the maximum FPGA density and direct-to-FPGA 100GbE port density available,” said Ron Huizen, BittWare Vice President, Platform Products. "With its tremendous compute power and networking capabilities, whether used for FPGA compute farms or network packet processing, this new TeraBox 1432D is going to be the foundation for some incredibly high-performance applications." Compared to a typical 4U server with 8 double-wide slots, the new TeraBox 1432D offers double the density per rack unit, both in terms of compute and I/O. 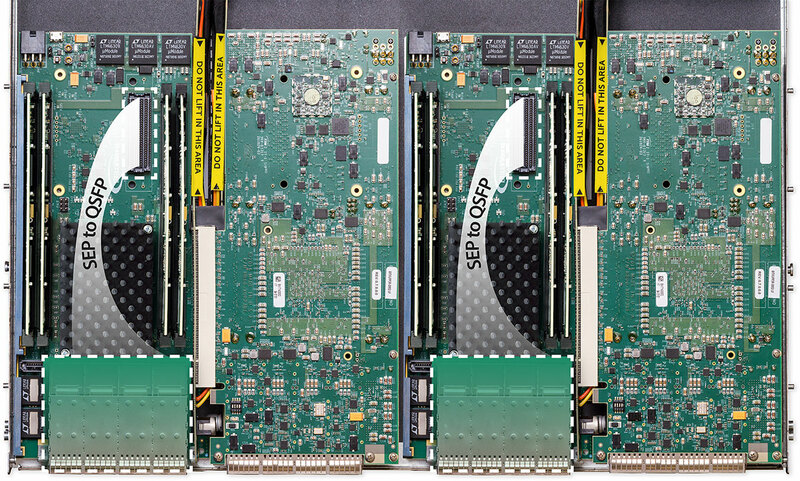 For example, BittWare XUPP3R boards can be fitted for eight QSFPs each. The standard TeraBox would therefore provide 64x 100GbE ports for its 4U chassis. However, the new TeraBox 1432D only takes up one rack unit for 32x 100GbE, so four of these new servers could provide 128x 100GbE ports in the same 4U space. In addition to port density, incredible memory and computational density is now available. Using four XUPVV4 boards, the 1U TeraBox 1432D would provide 15 million logic cells and up to 2 Terabytes of DDR4 SDRAM in 16 banks (in addition to the server’s main memory). Using four S10VG4 boards and Intel’s Stratix 10 FPGAs, users would have over 37 TFLOPs of compute acceleration available in a single rack unit. Again, this is double what is available in our standard 4U TeraBox. For customers requiring other network link speeds, the TeraBox 1432D delivers even more impressive 1U numbers with up to 128x 25GbE, 128x 10GbE, or 64x 50GbE ports. Financial customers can achieve the same ultra-low latency solutions using their preferred BittWare FPGA board at significantly higher port count and compute density than ever before. The TeraBox 1432D’s host configuration offers dual Intel Xeon E5-2600 v4 CPUs with up 1TB DDR4 memory in 16 banks. Dell iDRAC8 remote management is standard with optional Dell ProSupport. In addition, BittWare's suite of development tools, including SDAccel and OpenCL support, give users a premium FPGA platform for both development and datacenter operation. The new BittWare TeraBox 1432D is available Q1 2018 with the XUPP3R FPGA accelerator board. In 2018 BittWare will also release the Xilinx UltraScale+ VU13P-based XUPVV4, and the Intel Stratix 10-based S10VG4 boards, both of which will support the same 32x 100GbE server configuration. 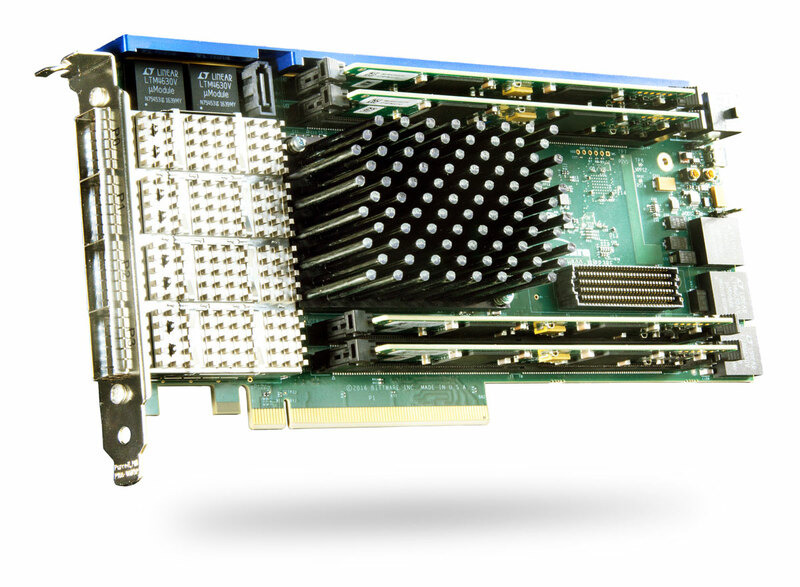 BittWare has also committed to PLDM support for its suite of FPGA boards, with expected deployment later in the year, to allow for integration of the boards monitoring and control with Dell's system management tools. Learn more about the TeraBox 1432D on BittWare.com.